Having a new puppy and a one year old is a fantastic combination. Puppy messes are always fun–torn up paper everywhere or the best yet–watching her run down the hall as fast as her little legs will carry her with one of the kids large stuffed animals in her mouth. Of course, now that she’s twelve weeks old, she can get into a lot more. 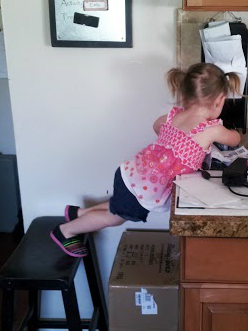 Jumping onto the couch is getting easier with a full running head start. Of course, there are times that she mistakes how far she has to jump and bounces off the couch instead of onto it. 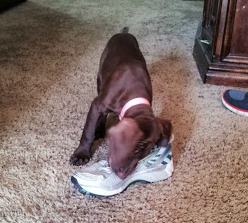 And now my running shoes aren’t chew toys. She knows that those running shoes will take her somewhere. She will pick them up and bring them to me. Of course, she chews them on the way though or stops halfway to take a nibble or two. Love those oversized ears and paws. Then there is the food issue. The puppy and the one year old are always making messes! Food isn’t for survival. It’s for play! P.S. Remember to put the puppy out quickly after the mess is made. 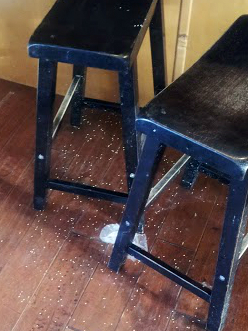 Quinoa Mess + Puppy = Pwew! for the rest of the day. (That should answer the question if dogs can have quinoa or not). The one year old can reach the things that the puppy can’t. Messes are always on two different levels in our house. She prefers loosing keys, cell phones, and writing on my calendar. Of course the more precarious the position, the better!